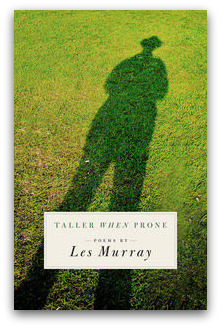 Les Murray: Taller when Prone. Black Inc., Melbourne, 2010. ISBN: 9781863954709. RRP $24.95. they've done you nothing but good! No recipes here, but this could be called a travel book, with the poet at home on the lonely planet. Visiting the Dead Sea and its 'clear Mars-gravity water' Murray reports that 'we drifted/ high as triremes'. In the Midi he sees lavender 'deeply planted as mass javelins/ in the hoed floor of the land'. And closer to Bunya, Bass Strait is an 'Undersea waterfall,/ no shoaling slants above/ nowhere a roaring wall'. Geography and abundance: the spruiker of sprawl continues to think big. and quite in keeping with past expectations, the travel we experience in our heads reading Murray is rapid, exhilarating, and very often new. Perhaps this is why we read and write poems in particular, to approximate the speed of connections that our minds make anyway every minute. Murray is intimating this awareness. Likewise, the familiar Murray modes of expression keep on keeping on. There is the peculiar language of surfaces — planes, angles, patterns — that seems to be his own preserve, and the related language of spatial surprise. 'He is often above you/ and appears where you will go,' he writes in 'Observing the Mute Cat'. We hear the bumptious tossing about of opinions, memories, snapshots, voices, history and cultural baggage. 'Infinite Anthology', for example, is a comic excerpt in the history of those favourite poems of everyone's, words themselves. Two of my favourites are 'blackout — Aboriginal party or picnic, whites not invited' and 'offbook — (theatre) having one's lines down pat'. And there is the talk, the never-ending talk which, as with any good poet when we are in the right mood, leaves us wondering how we ever did without it. A country poet of prodigious knowledge, Murray is always best in his seamless seeming. Having said that though, I personally can live without 'The 41st Year of 1968', a poem that would reduce the causes of the Black Saturday fires to differences in forest management between what he calls 'hippies' and 'rednecks', both of these straw men. Utilising poetry to play the blame game is unacceptable in this context and demeans our understanding of the complexity of that disaster. No one is better or wiser for this poem, but thankfully this collection has little of Murray's black-and-white polemic, a habit where he forgoes subtlety in the name of old prejudices and imagined paybacks. The Royal Commission is still in session. Les Murray's self-diagnosis of Asperger's Syndrome, made public in a remarkable previous poem called 'Asperges', marked a turning point in how we may appreciate both the man and his poetry. It in no way alters 'the achieve of, the mastery of the thing', but avails us of new insight. If one takes the diagnosis on face value, it opens insightful understanding of the kaleidoscopic, almost Shakespearean range, accessibility and especial use of his vocabulary. It may well shed light on the distinctive adversarial nature of much of his work about human relations, as well as Murray's self-styled isolation. Philip Harvey is Poetry Editor of Eureka Street. I find it annoying that in the link to this article in the daily email, you've chosen the one paragraph that is critical of Murray but connected to an obviously topical issue. It's hard not to suspect that this was done deliberately with a sensationalist objective. These are the tactics that the tabloid press uses and not what I expect from Eureka Street. 'Sensationalist'? That's a bit harsh. They can't exactly condense the whole review into one little teaser paragraph. It couldn't be done, and what would be the point? You can hardly blame them for choosing to use the most intriguing point from the review to tempt readers to click through and read the whole thing. And when they do click through they discover, as did I, that yes, it is a great review, that makes many other interesting points, apart from the one already revealed in the newsletter. Maybe sensationalist was a bit strong, Charles Boy, but the fact remains that the one critical comment in the review was what was used as the "teaser". I can see many other comments that would also have attracted me to the review and would have given me a much better appreciation of the other things that were/are being said. My responses are now clouded by the teaser. Was this criticism the real intent of the article and the other comments padding in which to put it? I guess what I'm saying is that the comment about the article that is placed in the email can colour your view before you even read the article. And that's not what I expect from Eureka Street. I see your point Erik H. Still the title of the review does allude to 'Murray's might', I guess that indicates that there's plenty of positive stuff to be found in the book too. Thank you Philip Harvey for your statement, " this collection has little of Murray's black-and-white polemic, a habit where he forgoes subtlety in the name of old prejudices and imagined paybacks. " You have helped me understand why I have always strongly disliked this man Murray. Previously my distaste has been visceral & aesthetic : a gut feeling of nausea; a sense of discomfort at the very sight and sound of the person. A wordsmith yes, but somehow, naively perhaps, I imagine a true artist to be able to rise above " black & white polemic " and to forego entirely "old prejudices and imagined paybacks." Let us recall, he was mates with our very own man of steel Mr. John Howard. An explanation for this may be found in the "distinctive adversarial nature of much of his work about human relations." Indeed: birds of a feather flock together. War films tread a fine line if they are to respect the experiences of soldiers without glorifying war. Beneath Hill 60 is the true story of Australian miner-soldiers tasked with tunnelling beneath the front lines during World War I. It is not unkind to the Anzac myths. The old people in the mortuary silence of the doctor’s waiting room, rehearse the look, the patois, become familiar with the creeping symptoms, the medicines of resistance, the gentle small steps on the way.